13,476 American Bulldogs adopted on Rescue Me! This map shows how many American Bulldogs are posted in each state. 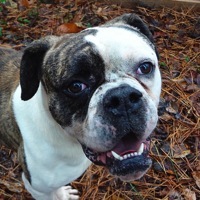 American Bulldog Rescue Information: The American Bulldog is an athletic, determined, loyal, and highly devoted breed. American Bulldogs are very affectionate towards children but should be supervised because of their strength. American Bulldogs are very protective of their masters and make great guard dogs. An American Bulldog can do fine in an apartment if it gets enough exercise and is walked daily. Like the English Bulldog, the American Bulldog tends to slobber. American Bulldog Trivia: The American Bulldog thrived in the colonial American South due to settlers' problems with feral pigs. American Bulldogs were their best means of controlling the pigs. American Bulldogs are descended from indigenous English Mastiffs that lived in the British Isles before the arrival of Caesar. Some American Bulldogs can jump six feet in the air. American Bulldogs have fought wild dogs, bulls, and even fire while defending their masters. The American Bulldog is a much closer relative of the Old English Bulldog than the modern English Bulldog is.